Cucumbers! And squash! Our challenges with pest and disease issues in our squash and cucumbers are not over, but we are for the first time this year having a good yield. The production won’t likely last long, so enjoy your cucumbers and squash while they are here. You are receiving a generous share of cucumbers, so see your recipe ideas below for options on how to store them. Transition to fall continues. With the dry, we’ve been having trouble getting our fall greens and roots started. Peas are struggling through the heat. It’s been too hot to start spinach, hopefully next week we can begin. Please know that the tomatoes are slowing down. We should have plenty to offer over the next several weeks, but the weeks of 3 pounds at a time may be gone. ***Melons- Melons continue to be rotated through members. Not everyone will get a melon this week, but we’re tracking who does, so one should be coming your way in the next couple weeks. If not, we have a planting in that should produce soon. We will REUSE the cherry tomato boxes from previous weeks. Please return them with your share bags. Water. The lifeblood. Wherever there is water there is life. Where there is more water, there is more life. It seems to me that in general, people are happiest in and around water. Seaside dwellers are happy people. People flock to waterways for pleasure, relaxation, thrill, and finding solace. Feeling feint? Drink water. Need to calm down? Water. Overexerted? Water. Need a pick-me-up? Water. Dirty? Clean with water. Fluidity- containing all properties, the answer to most, if not all. Drink a glass of it. Notice how it feels as it goes into your mouth, down through the neck, and falls into the basin of the stomach, emitting a simultaneous feeling of calm and rejuvenation. Without enough water, our bodies don’t have the lubrication they need to function fully. Drink plenty of water, then add lots of greens, and a little of everything else. Relax into the fulfilled and clean feeling. Heat small saucepan over medium high heat. Add vinegar, sugar, mustard seed, salt, and garlic to the pan and cook until it begins to simmer and the sugar dissolves. Toss the dill, bay leaf, and sliced cucumbers together in a heat-proof bowl. Pour the simmering liquid over the cucumbers and stir to evenly coat. Allow to cool to room temperature or chill before serving. Do you like pickles, salsa, or jelly? Preserving the summer’s bounty is a recipe for delicious eating in the winter. On top of that, it’s a way to cut the family food budget. You may find that some share offerings are especially generous for your household. The farm has given back a lot this year! We encourage you to check out this University of Missouri Extension website ( http://extension.missouri.edu/main/DisplayCategory.aspx?C=194 ) for suggestions and reliable information about safely preserving your fresh vegetables. 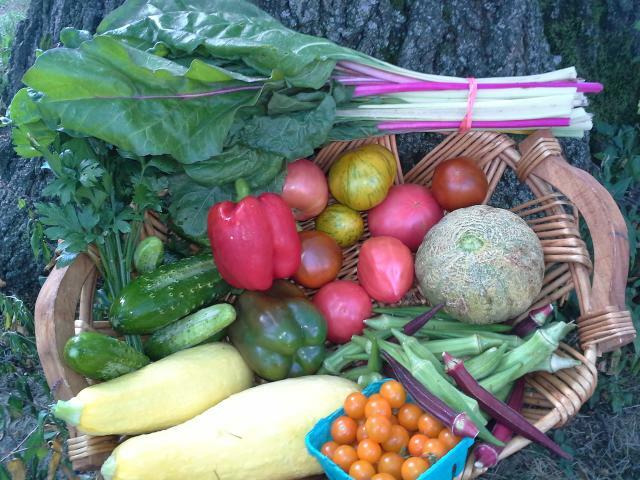 The next CSA dinner and cooking class is Tuesday, September 24. Come join us. It really is fun, like going out to eat. You also get to meet new people and learn a recipe instead of dipping into the pocket book. We are postponing our Second Saturday for September as we have several exciting events coming up in later weeks. We will be building a hoop house at Bethany Peace Church, and a chicken coop at our expansion site in Bel Ridge. Come learn about growing food year round, and keeping chickens!